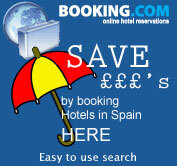 Lanzarote is a hot and sunny island with some of the best beaches in the Canaries. It has a dramatic inland volcanic landscape and lies just 60 miles off the African coast which give it warm winds, ideal for windsurfing. The island has a multitude of contrasts to offer the holiday-maker from the tiny, quiet coves around the Papagayo peninsula where you will find peace and tranquillity around the calm, turquoise waters, to the pulsating lifestyle in the Puerto del Carmen area where the entertainment goes on most of the night. The Playa Blanca area is a little more low key with a handful of bars and restaurants to tempt you but most of the entertainment is hotel-based. Whilst the beaches are the main attraction here, you should not leave without making a trip inland to the Timanfaya National Park where you will be surrounded by lunar-like landscapes, volcanic cones and craters. Fire Mountain shoots geysers up into the sky. Venture to the north of the island and drive through tiny villages and visit the volcanic Green Cave. Puerto del Carmen, a long, narrow resort stretching for 3km along the main coastal road. Dozens of shops, bars and nightclubs line the main street. Behind these are low-rise apartments. The beaches are very clean and the water is generally calm which makes it an ideal resort for children. Playa de los Pocillos, quieter than del Carmen, with a good supply of low-rise apartments but fewer shops and pubs. Golden, sandy beaches are clean and well cared for and the waters are shallow and calm. Matagorda, a small resort that has grown up around its beach. There are very few clubs and bars so it is much quieter, however it is nearer the airport so aircraft noise is evident. Beautiful, golden sand is a major attraction here and there is a windsurfing school. 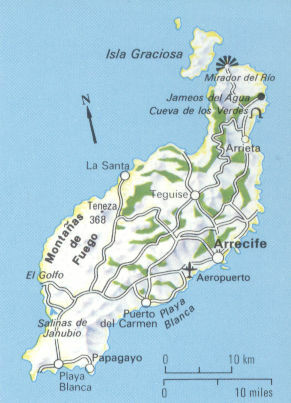 The airport is located at Arrecife.